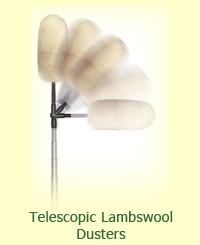 Premium Classic Lambswool Dusters: "The Wool Shop"
Napa Sew & Vac stocks most Wool Shop items. 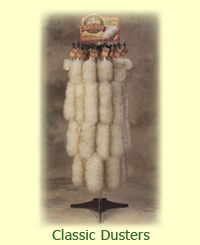 Wool Shop "Classic" Dusters are made of premium-tipped lambswool that act as a magnet to naturally attract and hold dust particles without the use of cleaning chemicals. 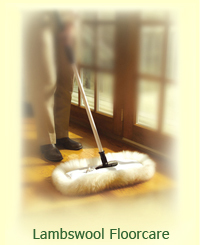 The dusters comes complete with a solid hardwood handle for added strength and natural appeal. The hand-tied leather hang strap with an attractive hangtag provides a unique visual merchandising technique for retail display. The natural look of wool and wood makes our Classic Duster an enticing choice for our customers, thoughtfully made in a myriad of sizes. Easy to Clean: To remove the dust twirl handle between your hands to fluff. 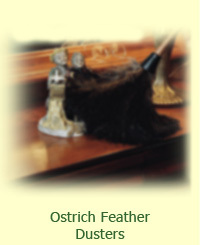 If wool becomes matted, comb and fluff the wool with our Wool Shop Duster Care Brush. 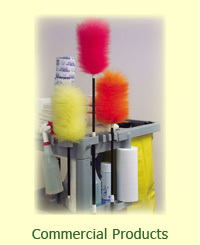 If the duster becomes excessively soiled, HAND WASH using our Wool Shop Duster Shampoo. Microscopic image of wool fiber showing the overlapping scales that make up the cuticle layer. Notice the difference between the physical structure of the wool fiber and man-made synthetic. Wool is a natural fiber that has an abundance of unique attributes. The physical make-up of wool fiber is so complex it can never be duplicated or imitated by man-made synthetic processes. At Wool Shop, we adhere to strict quality standards to assure the wool we use is of the highest quality, making Wool Shop products beyond comparison. The Epicuticle is a thin protective film covering the cuticle (scales) which makes the wool fiber more resistant to abrasion. 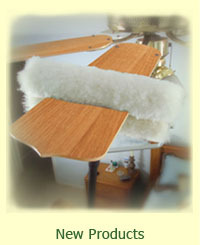 Wool Shop dusters can be used on the most delicate of surfaces. The Cortex is the main inside layer of the fiber that composes 90% of the fiber mass. Because of the amazing cable-like strength of the Cortex each wool fiber is so elastic and resilient that it can be bent over 20,000 times without breaking or damaging the fiber. When you think long-lasting durability, think Wool Shop dusters. The Cuticle layer is the outer part of the wool fiber and is composed of hundreds of microscopic, overlapping scales. Tiny pockets between the scales naturally trap and hold dust particles. This amazing feature has made Wool Shop dusters famous for their dust-grabbing ability.